Fast ship! No complaints, Thank You! Excellent packaging, product as advertised. Bought two of these hoping to get better receptions on my reciever. Nope. i replaced my existing antenna with the Terk model and there was a noticeable difference in my reception of AM stations. 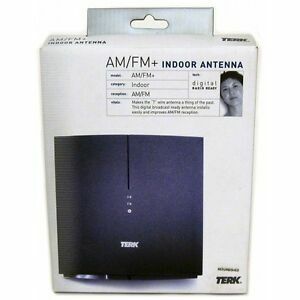 The FM stations have never been an issue and the Terk antenna performs well for all the FM stations I listen to. I had expected the AM stations to come in stronger, and a few are stronger. One station had a howling sound in the background that the Terk antenna greatly improved upon. Overall there was better reception, but I had expected more improvement with the Terk antenna than I have experienced. Looks nice, but no help for me. Describe the pros, cons, and other highlights. The unit says AM and FM, unlike a current model that is FM only, so mine has separate wires for AM and FM. I use mine on my fridge, which is probably not an ideal location. My apt. building is brick, as well. I don't know about using it regular wood-framed houses, but it not only doesn't improve reception for me, its reception is worse than just a plain wire FM antenna. My radio has no input for an AM antenna. Somehow, I was under the impression it was amplified, but there is no electrical hookup. Terk does make more expensive antennas, some of which are amplified. We live rural so radio reception is sketchy at best. After installing this we do receive more channels plus the original channels we previously received. Many of the are not as clear as we expected. The antenna need to be moved around a lot to accommodate different channels which is bothersome. One station will be on top of the radio. Another will be 2 feet to thew right and another four feet to the left while another requires the antenna to be on the ground. Because of this I cannot really say it is Omnidirectional as advertised. This i why only three starts. I installed on a H&K receiver. I could not pick up any station including my local station that transmits from 4 miles away. I piece of wire in the antenna clot was more effective. I also tried a terk amplifies antenna of similar design that was able to pick up my local station but none of the Philly stations that are approx 30 miles away. As a comparison. A 30 y/o Sanyo boom box in the same location was able to pick up most philly stations.